Hamm Beach is located at Ferrybridge and is the beach on the eastern side of the causeway linking Portland to Weymouth and faces into Portland Harbour. It is composed of underlying shingle with low sandunes on top. The northern end has been split by the building of the new bridge and channel south of the original channel and this has left an isolated remnant between the two channels. South of the new channel, the beach has been built on to form a boatyard, boat storage area and wind-surfing school. 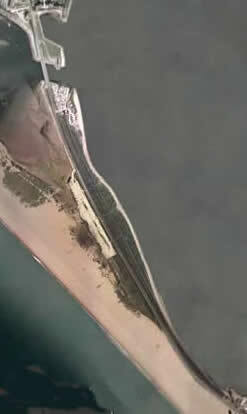 There is also an abandoned railway line running the length of the beach and the main A354 road to Portland runs along the western edge of the beach. 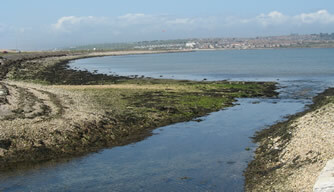 At the southern end, Hamm Beach ends at the drainage channel from the Chiswell flood relief scheme. The southward continuation of the tombolo is now completely submerged under modern development. Hamm Beach is part of the Chesil and Fleet Special Area of Conservation (SAC) because it has shingle vegetation communities and it is part of the continuum of shingle vegetation supported by the SAC as a whole and adds to the diversity of communities within the SAC. The underlying shingle does not come from Chesil Beach. It primarily comes from fallen debris from the east side of Portland that has been transported northwards before the harbour breakwaters were built. The overlying sand is wind-blown from the Portland Harbour sandflats. These were part of the series of sandy beaches around Weymouth Bay but are now isolated by the building of the breakwaters. 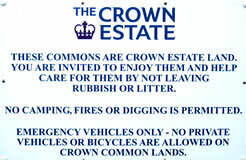 Hamm Beach is owned by the Crown Estate.